There are so many foods that you need to avoid while you are expecting, including some you may not have heard about before. Radishes are nutritious and they supply a wealth of nutrients you need during pregnancy, but, as with any food, the vegetable can also pose a danger if eaten or prepared in the wrong way. Knowing the hazards associated with radishes will help you determine whether these vegetables have a place in your pregnancy diet. A serving of radishes will supply you with several of the vitamins and minerals you and your developing baby require. You will get a small dose of calcium, which helps to support the development of your unborn baby's bones, teeth and muscles. A serving of radishes also provides you with folic acid, which reduces your chances of having a baby who suffers from certain birth defects. Radishes also provide potassium, vitamin C and iron. The danger associated with eating radishes is that raw vegetables can be contaminated with bacteria that can lead to serious illness. Colorado State University notes that your immune system is suppressed during pregnancy, which increases your chance of developing a bacterial or parasitic infection. Toxoplasmosis is passed through contaminated soil or by foods grown in contaminated soil. You can also get salmonella or E.coli from eating contaminated vegetables, such as radishes, that have not been washed. The radish leaves also pose similar dangers. If you choose to include radishes in your pregnancy diet, wash them with warm soap and water before eating. Scrub any visible dirt off the surface of the radish and rinse well before slicing or chopping. Heat will kill the bacteria or parasites that can make you ill, so sauteing your radishes may also help reduce your risks. Wash and cook radish leaves as well, because they can also harbor these illness-causing germs. If you decide that radishes have a place in your pregnancy diet, there are numerous ways to take advantage of the nutrients they supply. Slice well-scrubbed radishes into a tossed green salad or garnish vegetable soup with a few slices. Halved radishes can be paired with low-fat salad dressing for a healthy snack. Sauteed radishes or radish greens make a healthy side dish or can be added to pasta sauce or stew. Shred a few radishes into cole slaw as another way to get the nutrients they supply. 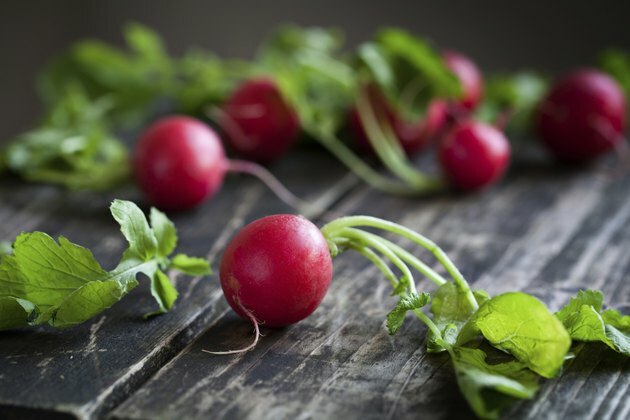 Are Radishes Good for High Blood Sugar? Can You Eat Edamame During Pregnancy?